with apps downloaded from the Android Market. when you purchase online from Harris-Wireless. True business! How can you get paid $$$ money? solution that’s right for you. plaintiffs’ litigation law firms in America. Corporate doubletalk? Very certainly so. design was done by a deaf student. with the deaf of Vietnam. involvement of the deaf in the artistic and cultural fields. surviving because of the continuous political and tribal upheaval? seeking Master’s students to apply for the Deafness Concentration. offered in summer term by the UT Center on Deafness. persons who are deaf or hard of hearing. and complete the program in two years. A number of RSA Traineeships are available to students. Do your holiday shopping at WCI from the comfort of your home! We’re now on Facebook! Come visit us! staff got him ready for the operation. because the operation was canceled. were missing and cannot be found. room staff cannot find the stuff! comic book ideas, especially with a new superhero. of which is telepathic skills. we, the deaf, cannot be controlled? deaf senior citizens equally in need. costs involved to enroll a deaf patient. homes but most have failed. husband Sean is the state Governor. What is the difference between both First Ladies? University of Alaska at Anchorage. 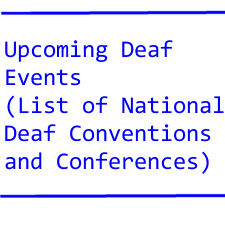 DeafDigest hopes Sandy’s project will bear fruit! possibly both unaware of each other’s whereabouts. slipped him a note, asking him to cease and desist. We have a number of deaf poker tournaments in USA. Do these tournaments help Deaf Sports? No. annual New South Wales Deaf Poker State Championship. choice of another deaf sporting organization. writer saying a deaf person has become a deaf person? conduction hearing aids (pretty much obsolete). work was written up in the Nature, a publication. showing that she went out and wrote a short poem. am sharing it with DeafDigest. while playing the rough game of football? A. Forget it! Just take off the CI and enjoy playing football. newlyweds are still living nowadays! Sorry, the identity of the deaf judge is lost to history. 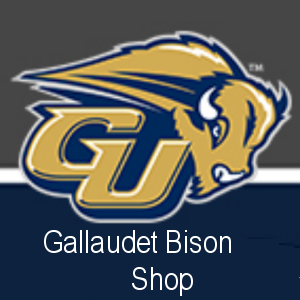 higher than the president of Gallaudet University! Please apply if you are interested in any of these positions. on specific position you are interested in. individuals from protected classes for available positions. database systems as well as analysis to provide data reports. strong organization, communication, writing and leadership skills. obtaining insurance authorizations and resolving discrepancies. billing by summarizing billings, adjustments, and revenues received. open for weekend and evening shifts. Deaf and Deaf/Blind community since 1901. We are a three-facility campus: independent living, rest home and SNF. Deaf and hard of hearing are encouraged to apply. prior to December 15, 2009. NEHD is an equal opportunity employer. part of our team. We are an equal opportunity employer. Human Resources at 516-922-4100 ext. 224.
and implementation for the Sprint Distance Learning Initiative Programs. Provide support for all the other Pre-College Outreach Programs. implementation for the Spring Distance Learning Initiative Programs. special projects within and/or across operating departments (i.e. assesses information, and develops and prepares recommendations. and University policies and procedures. f. Performs related duties as assigned and required. or related field preferred. 1-2 years of event planning experience. communication skills. Proficiency with ASL strongly preferred. Review of applicants will begin in December.